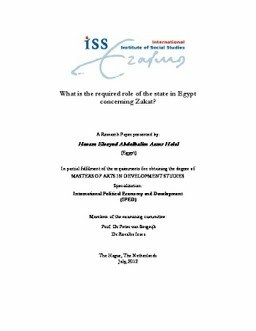 Erasmus University Thesis Repository: What is the required role of the state in Egypt concerning Zakat? What is the required role of the state in Egypt concerning Zakat? In this paper I discuss "Zakat", which is considered a form of charity that must be paid from a person`s wealth ( when his /her wealth exceeds or reaches a “specific amount” of money (or other types of wealth like gold ) So when the wealth reaches this level or (the specific amount ) the person who owns this wealth should pay a specific amount for the poor and this amount goes to the poor named Zakat” (Al-Qaradawi,1999). At the end, I conclude that “Zakat” is an effective and practical approach to reduce poverty and it could be applied in Egypt with a significant role from the state in three main directions: institution ,law and media , that I will explain that the threotical framework of neoliberalism and the successful practices in Zakat highlight the importance of the role of the state in any policy aiming for poverty reduction.